Is your kiddo a huge fan of Halloween as well as Thanksgiving? Well, then we have the perfect costume for him to run around in during the colorful festivities this coming Fall. Make your little one’s face light up when you show off this amazing Kid's Turkey Costume! Whether your youngster wants to flap his wings and fly around the block this Halloween or has the honor of playing the main course in a Thanksgiving play, this is the costume to do it in! As a turkey, your kiddo will be much more than the poster-child for Thanksgiving. Your child will also be the bird that came in second to the eagle as the United States’ national emblem. Personally, we agree with ole Ben Franklin. He thought the turkey was a bird that’s respectable while the eagle had lacked courage and morale. So if you think that your youngster is bold, honest, and ready to fly, then this is the costume for him. Benjamin Franklin would be proud to see that the spirit of the turkey is still alive and well in the country he helped founded. Your little one’s feathery transformation will be quick and easy. Once he jumps into the colorful jumpsuit all that needs to be done is securely attaching the turkey headpiece and popping the yellow foam shoe covers on. 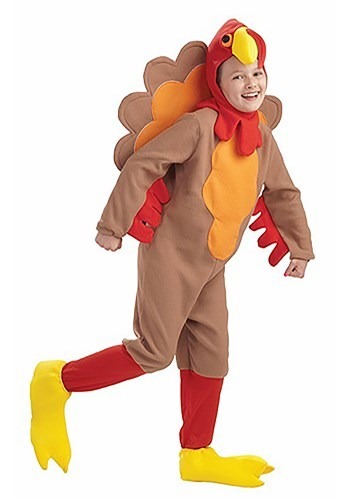 This Kids Turkey Costume will be a perfect reminder during Halloween to be thankful and will certainly make any Thanksgiving celebration stuffed with even more fun!